The Greater Vancouver Area is known for its wet climate but nowhere more so than the town of Tsawwassen. In an area built around water, winter can be a huge pain! The amount of foot traffic through the area does not stop and neither should you. Our Tsawwassen snow removal and salting service is here to make sure that you don’t miss a beat. There are two types of Canadians: those who love the winter and those who can’t wait for it to end. In either case, we can all agree that snow removal can be a real pain. There is no worse feeling than waking up in the morning to find your car sealed in by a heavy snowfall. Or, to have wet feet from trudging through snow. Our Gorillas want to help you get back to the enjoyable parts of those chilly months. In order to best serve our communities, Gorilla technicians monitor incoming weather patterns. By keeping one step ahead of the snowfall, Gorillas are able to better serve our clients by being prepared for anything that comes. Our services can be made to fit the individual needs of your property. When there is need for snow clearing over night, our Gorillas can be quiet as mice. 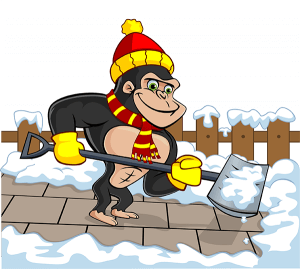 By partnering manual labour with a good, old-fashioned shovel, Gorilla technicians can have your property cleared away without you ever knowing we were there. On the off chance that you do wake up, there is no need to be spooked. Gorillas are easy to identify, with bright uniforms and flashy vehicles. When it comes to commercial properties, we are ready to pull out the big guns! With industrial snowblowers and ploughs, we are able to clear areas as small as sidewalks or as large as parking lots. Whatever the need, our Gorillas can get it done. Salt, Salt And More Salt! When it comes to coping with winter weather, one of the hardest tasks is to stay on your feet! Climates throughout British Columbia can be erratic. With freezing temperatures one day and sunshine and warmth the next, ice can form quickly. By salting, you eliminate the slip and fall factors that come along with large amounts of ice. More than simply throwing it down, there is a process to laying salt in order to make it more effective.